BAD black leather belt worn by Michael in Bad session and signed inside with gold marker. A pair of black spandex, fingerless forearm gloves with covered thumbs, three silver metal buttons on the underside of the wrist and eight silver metal, tooled buckle sets on the outside of the arm. Worn by Michael during the filming of the BAD video. Unique BAD video black leather belt signed by Michael inside with gold marker 'With Love Michael Jackson'. Collection of five accessoires including a black leather belt, a gold metal necklace, a matching bracelet and rectangular epaulets. The belt can be seen on Michael's dressing room table in the opening sequence of Moonwalker. Black leather belt with five silver metal panels featuring faceted crystals. The belt can be seen on Michael's dressing room table in the opening sequence of Moonwalker. Black leather with silver metal bandolier and a silver shoulder guard worn by Michael during a 1987 BAD era photoshoot. Designed by Bill Whitten. Black leather belt with metal and rhinestones. A label on the verso reads "Michael Morrison MX Los Angeles." A pair of black Ray-Ban Wayfarer sunglasses, worn by Michael Jackson in his everyday life. Michael wore this studded belt on May 27th, 2006 at the MTV Japan Music Video Awards held at Yoyugi Olympic Stadium in Tokyo, Japan. 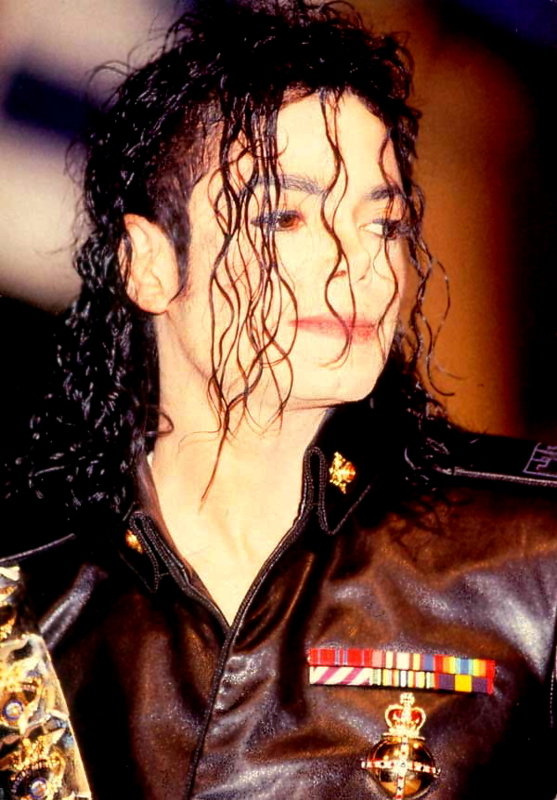 Michael was presented the "Legend Award" for his "magnificent contribution to the art of music video." A black satin belt with a silver belt buckle designed by Michael Bush and Dennis Tompkins, as labelled on the inside. The belt is covered with metal badges reading “Security Officer”. Four rhinestone chain bracelets in different sizes each featuring safety chain, and pinch snap closure. Crown with rhinestones and large faceted faux gemstones on a custom red velvet cushion and Michael's initials "MJJ" on top. Brown leather belt with black stitching and round buckle. Embellished with flat Swarovski crystals. The belt is stamped on verso "Nudie's Rodeo Tailors 5015 Lankershim Boulevard No. Hollywood, Calif. 91601". Decorative patch with gold elements and amber stones on black felt. Custom Patch "Gold Wreath With Crown"
Decorative patch on black felt with a gold threaded wreath around a red velvet panel and a crown. Custom Patch "Green Cabochon Stone"
Decorative patch with gold metal and thread, a green cabochon stone and two griffins on black felt.